“A major money laundering country is defined by statute as one ‘whose financial institutions engage in currency transactions involving significant amounts of proceeds from international narcotics trafficking.’ However, the complex nature of money laundering transactions today makes it difficult in many cases to distinguish the proceeds of narcotics trafficking from the proceeds of other serious crime,” said the report. It added that in such jurisdictions, quick, continuous, and effective anti-money laundering efforts by the government are critical. The Narcotics Strategy Report notes that Belize is not a source country for illegal drugs or precursor chemicals, but it continues to be used as a transshipment point for cocaine and precursor chemicals. “Belize is susceptible to the transshipment of illegal drugs due to its position along the Central American isthmus between the United States and drug producing countries in South America. Large stretches of unpopulated jungles on the border with Guatemala and a relatively unpatrolled coastline that includes hundreds of small islands and atolls make it difficult to conduct interdictions. Remote jungles provide a hospitable environment for the growing and transferring of cannabis,” it said. Belizean authorities eradicated 50,897 cannabis plants (down from 53,399 through the same period in 2014) and seized slightly over 26 kilograms (kg) of heroin during the first 10 months of 2015, the report said. It added that 2.8 kg of cocaine and a trace amount of methamphetamine were seized. Although Belize has been listed along with countries like Afghanistan, The Bahamas, Colombia, Costa Rica, Guatemala, and Mexico, the US narcotics report notes that financial institutions in Belize do not engage in currency transactions related to international narcotics trafficking that include significant amounts of US currency, currency derived from illegal sales in the US, or illegal drug sales that otherwise significantly affect the US. It said that over the last 3 years Belize made a turnaround in strengthening its legal infrastructure for oversight of the financial industry and clarifies that Belize is “not subject to sanctions or penalties” by the US or any international organization. The declaration is notable against the backdrop of decisions by some US banks to sever correspondent banking relations with Belize banks—this despite declarations which Belize Prime Minister Dean Barrow said have been made by US authorities that there is no problem with the Belize jurisdiction. It added that Belizean officials suspect there is money laundering activity in the two free trade zones: the Corozal Commercial Free Zone, which is located at Belize’s northern border with Mexico, as well as the smaller CFZ, the Benque Viejo Free Zone, which is located on the western border with Guatemala. 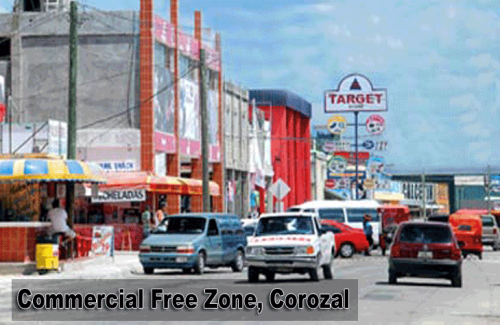 The Corozal CFZ is designed to attract Mexican citizens for duty free shopping; Belizean authorities believe it is heavily involved in trade-based money laundering and the illicit importation of duty free products. Two weeks ago the Atlantic Bank informed businesses in the Corozal Free Zone which trade in cigarettes that it cannot maintain accounts with them. Amandala was reliably informed that the businesses were already registered for the trading of the cigarettes they carry, but the concern seemed to be that cigarette trade is deemed to be one route for channeling the proceeds of money laundering.